I’ve told this story many times, but I just came across the original photo, forever stored on the Cloud. It was June 14, 2003, and Elyn and I were visiting Paris. We were seated at an outdoor café near the Champs-Élysées having one of those lovely Paris evenings. A man and his dog entered the café and was seated just behind us. His little dog took his place just opposite his master as he must have hundreds of times before. 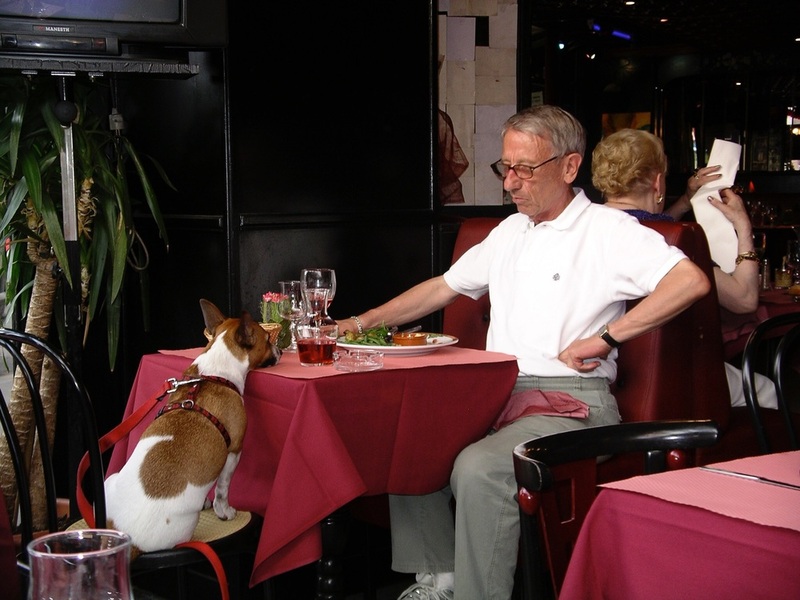 The man ordered his evening meal and the dog waited patiently. When the meal came the little dog put his nose on the table and stared directly at his friend. Elyn turned and snapped the photo you see here. What followed was that the man shared his evening meal with his companion. Both were totally at home in the restaurant, and the waiters knew them well. I’ve used the word “master” as a play on the old RCA Victor logo, but I’m not sure who was the actual master in this very close duo. I’ve told this story many times, but the photo was lost in the thousands of photos we’ve taken over the years. When I came upon it, the original scene was just as I remembered it. I am very happy to share this special moment with you. Thirteen years have passed and that little dog must have long since died. I post the photo here as an example of the special love that can exist between species on this planet. May that little dog (and perhaps his friend) rest in peace.